President Richard Nixon entered office in 1969 with Chief Justice Earl Warren having announced his retirement from Supreme Court of the United States the previous year. Nixon appointed Warren E. Burger to replace Earl Warren, and during his time in office appointed three other members of the Supreme Court: Associate Justices Harry Blackmun, Lewis F. Powell, and William Rehnquist. Nixon also nominated G. Harrold Carswell and Clement Haynsworth for the vacancy that was ultimately filled by Blackmun, but the nominations were rejected by the United States Senate. Nixon's failed Supreme Court nominations were the first since Herbert Hoover's nomination of John J. Parker was rejected by the Senate. While Nixon was a candidate for president, the sitting Chief Justice, Earl Warren, had long since become a lightning rod for controversy among conservatives: signs declaring "Impeach Earl Warren" could be seen around the country throughout the 1960s. The unsuccessful impeachment drive was a major focus of the John Birch Society. In his presidential campaign, Nixon had pledged to appoint a strict constructionist as Chief Justice. Many speculated that President Richard Nixon would elevate sitting Justice Potter Stewart to the post, some going so far as to call him the frontrunner. Stewart, though flattered by the suggestion, did not want again to appear before and expose his family to the Senate confirmation process. Also, he did not relish the prospect of taking on the administrative responsibilities delegated to the Chief Justice. Accordingly, he met privately with the president to ask for his name to be removed from consideration. Through speeches like this, Burger became known as a critic of Chief Justice Warren and an advocate of a literal, strict-constructionist reading of the U.S. Constitution. Nixon's agreement with these views, being expressed by a readily confirmable, sitting federal appellate judge, led to the appointment. The Senate confirmed Burger to succeed Warren by a vote of 74-3 on June 9, 1969. Senators Eugene McCarthy (DFL-MN), Gaylord Nelson (D-WI) and Stephen Young (D-OH) voted against the nomination. Senator J. William Fulbright (D-AR) simply voted "present." In total, 22 senators did not vote on the nomination, with Minority Whip Hugh Scott (R-PA) noting that of the senators absent, Marlow Cook (R-KY), Hiram Fong (R-HI), Barry Goldwater (R-AZ), Jacob Javits (R-NY), George Murphy (R-CA), Charles Percy (R-IL) and Winston Prouty (R-VT) would have all voted to pass the nomination. Burger was sworn in as the new Chief Justice on June 23, 1969. In 1969, Abe Fortas resigned from the Court due to conflict of interest charges, creating an opening for Nixon's second nomination to the Court. Nixon asked Lewis F. Powell, Jr. to accept a nomination to the Court at that time, but Powell demurred. On August 21, 1969, Nixon nominated Clement Haynsworth, then a judge on the Fourth Circuit Court of Appeals. 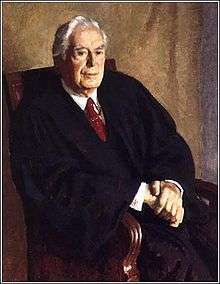 Haynsworth was opposed by Democrats (possibly in retaliation for the Republicans' rejection of Fortas as Chief Justice), Liberal Republicans, and the NAACP. He was alleged to have made court decisions favoring segregation and being reflexively anti-labor. Also, he was accused of ruling in cases where he had a financial interest, although this was never proven. Interestingly, his nomination was supported by the Washington Post, generally considered to be the "liberal" newspaper in Washington, D.C. Haynsworth was later termed a "moderate" who was "close in outlook to John Paul Stevens." Haynsworth was defeated by a 55 to 45 vote on November 21, 1969. 19 Democrats and 26 Republicans voted for Haynsworth while 38 Democrats and 17 Republicans voted against the nomination. Haynsworth was the first Supreme Court nominee since John J. Parker (1930) to be defeated by the Senate. On January 19, 1970, Nixon nominated G. Harrold Carswell to the seat. Carswell was praised by Southern Senators including Richard B. Russell, Jr., but was criticized by others for the high reversal rate (58%) of his decisions as a District Court Judge. Civil-rights advocates also questioned his civil rights record; in 1948, Carswell had voiced support for racial segregation while running for a seat in the Georgia state legislature (in his hometown, Irwinton, Georgia; Carswell did not win the election and moved to Florida where he started his career as a private attorney). In defense against charges that Carswell was "mediocre", U.S. Senator Roman Hruska (R-NE) stated, "Even if he is mediocre, there are a lot of mediocre judges and people and lawyers. They are entitled to a little representation, aren't they, and a little chance?" That remark is believed to have backfired and damaged Carswell's cause. On April 8, 1970, the United States Senate refused to confirm Carswell's nomination to serve on the Supreme Court. The vote was 51 to 45, with 17 Democrats and 28 Republicans voting for Carswell, and 38 Democrats and 13 Republicans voting against him. Nixon accused Democrats of having an anti-Southern bias as a result. On April 15, 1970, Nixon nominated Minnesotan Harry Blackmun to fill the Fortas vacancy. Blackmun was confirmed by the Senate by a vote of 94-0 on May 12, 1970. Senators Birch Bayh (D-IN), Al Gore, Sr. (D-TN), Richard Russell, Jr. (D-GA), Barry Goldwater (R-AZ), Karl E. Mundt (R-SD), and John Tower (R-TX) did not vote. Majority Whip Ted Kennedy (D-MA) and Minority Whip Robert P. Griffin (R-MI) made public note on the Senate floor that, out of the six senators not in attendance for the vote, all of them would have voted to confirm Blackmun. On August 28, 1971, Justice Hugo Black admitted himself to the National Naval Medical Center in Bethesda, Maryland. Black subsequently retired from the Court on September 17, thereafter suffering a stroke and dying eight days later. At the same time, Justice John M. Harlan was suffering from deteriorating health, and he retired from the Supreme Court on September 23, 1971 (he died December 29, 1971). Nixon initially intended to nominate Virginia Congressman Richard Harding Poff, but before Nixon could formally nominate him, Poff withdrew. John Dean wrote that Poff actually made that decision based on concerns that he would thus be forced to reveal to his then-12-year-old son Thomas that he had been adopted. Poff's concern was that the child would be negatively affected by that kind of information if revealed before he was old enough to understand. In mid-October, Nixon's White House released a list of six potential candidates for the seat, to which Time Magazine responded with a scathing editorial, stating that Nixon had an "opportunity to redress the embarrassment of his two unsuccessful Supreme Court nominations", but that the names released "demonstrated his inability or unwillingness to nominate renowned jurists to the highest tribunal in the land". The list included: West Virginia Senator Robert Byrd, Arkansas attorney Hershel Friday, California appeals court judge Mildred Lillie, Fifth Circuit judge Paul Roney, Fifth Circuit judge Charles Clark, and District of Columbia judge Sylvia Bacon. Although Byrd's name was on the list, the White House had previously indicated that he was not a serious candidate for the seat. Nixon thereafter announced his intention to nominate Hershel Friday to fill Black's seat, and Mildred Lillie to fill Harlan's seat; Lillie would have been the first female nominee to the Supreme Court. Nixon relented after the American Bar Association found both candidates to be unqualified. Nixon then approached Lewis F. Powell, Jr., who had declined the nomination in 1969. Powell remained unsure, but Nixon and his Attorney General, John Mitchell, persuaded him that joining the Court was his duty to his nation. Powell and Assistant Attorney General William H. Rehnquist were both nominated on October 21, 1971. The Senate confirmed Powell by a vote of 89-1 on December 6, 1971. Fred R. Harris (D-OK) was the only senator to oppose the nomination. Senators Wallace F. Bennett (R-UT), Peter H. Dominick (R-CO), David H. Gambrell (D-GA), Hubert Humphrey (DFL-MN), Daniel Inouye (D-HI), Jack Miller (R-IA), Frank Moss (D-UT), Karl E. Mundt (R-SD), Charles Percy (R-IL) and Robert Stafford (R-VT) did not vote. Majority Whip Robert Byrd (D-WV) announced that, out of the absent Democratic senators, Senators Gambrell, Humphrey, Inouye and Moss would have voted to confirm Powell. Minority Whip Robert P. Griffin (R-MI) announced that, out of the absent Republican senators, Senators Bennett, Dominick, Percy and Miller would have voted to confirm Powell. The Senate confirmation of Rehnquist, a law clerk for the late Justice Robert H. Jackson, was much more contentious. The loudest concerns were voiced by Senators Birch Bayh (D-IN) and Philip Hart (D-MI), who brought up that Rehnquist's nomination was opposed by a record number of unions and organizations, including the AFL-CIO, the United Auto Workers, and the NAACP. The Senate put the concerns to a vote on December 10, 1971, and Rehnquist's nomination passed by a vote of 68-26. Of the 26 senators voting to kill the nomination, nearly all were Democrat; only Clifford P. Case (R-NJ), Edward Brooke (R-MA) (the lone African-American senator at the time) and Jacob Javits (R-NY) jumped party lines in the vote. Senate Majority Leader Mike Mansfield (D-MT), after having previously voted "nay," withdrew his vote as a goodwill gesture to Senator Charles Percy, who could not attend the vote; he would have voted "yea" and counteracted Mansfield's vote. In addition to Percy, Clinton P. Anderson (D-NM), Wallace F. Bennett (R-UT), Karl E. Mundt (R-SD) and Margaret Chase Smith (R-ME) did not vote. Minority Whip Robert P. Griffin (R-MI) announced that Senator Smith would have voted to confirm Rehnquist. With both votes confirmed, Powell and Rehnquist were sworn in on January 7, 1972. ↑ Political Research Associates, "John Birch Society"
1 2 Woodward, Bob; Scott Armstrong (September 1979). The Brethren. Simon & Schuster. ISBN 0-671-24110-9. ↑ Laura Kalman (1990). Abe Fortas. Yale University Press. ISBN 978-0-300-04669-4. Retrieved 2008-10-20. 1 2 3 4 David A. Kaplan (1989-09-04). "The Reagan Court - Child of Lyndon Johnson?". The New York Times. Retrieved 2008-10-20. 1 2 A Seat for Mediocrity?, Time Magazine (March 30, 1970). ↑ "Crony cachet". Washington Times. October 5, 2005. ↑ Dorsen, Norman; Newcomb, Amela Ames (2002). "John Marshall Harlan II: Remembrances by his Law Clerks". Journal of Supreme Court History. 27 (2): 138–175. doi:10.1111/1540-5818.00040. ↑ Dean, John (2002) . The Rehnquist Choice: The Untold Story of the Nixon Appointment That Redefined the Supreme Court. New York: Touchstone. p. 119. ISBN 0-7432-2607-0. ↑ Ellis, Kate. "Interview with John Dean". The President Calling. American RadioWorks. Retrieved 2007-01-08. Poff ... didn't really want to put himself or his family through the controversy of being nominated and then beat up through the senate confirmation process. 1 2 3 4 5 6 7 8 9 10 "The Nation: Nixon's Not So Supreme Court" (Monday, Oct. 25, 1971). ↑ a MetNews staff writer (October 31, 2002). "Justice Lillie Remembered for Hard Work, Long Years of Service". Metropolitan News-Enterprise. Retrieved 2008-08-16. 1 2 3 4 5 6 7 8 9 10 11 12 13 14 15 16 17 18 19 20 21 22 23 24 25 26 27 28 29 30 31 32 33 34 John Dean, "Cast of Characters: Candidates considered for the Supreme Court", The Rehnquist Choice: The Untold Story of the Nixon Appointment That Redefined the Supreme Court (Free Press, 2001), p. xiii-xiv. ISBN 978-0-7432-2979-1. 1 2 3 4 5 6 7 8 Woodward, Bob; Armstrong, Scott. The Brethren: Inside the Supreme Court. Simon & Schuster. pp. 189–196. ISBN 978-0-7432-7402-9. ↑ Dean later notes that "Bill Pullman from Philadelphia" was suggested by Attorney General John Mitchell because Pullman was a black Republican, but was quickly dismissed by Nixon because such an appointment would put two blacks on the court.